Portland, Oregon is a city of dazzling contrasts -- a place where bacon-covered donuts and industrial-strength microbrews sit comfortably next to vegan cheeseburgers and triple-soy lattes. In Portland, the sky is blue, the water is aqua-green...and the cultural layers are infinite. 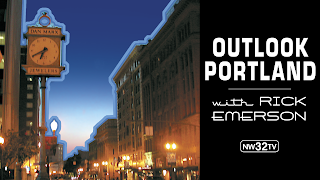 Every Sunday morning, a show called Outlook Portland invades our television screens, showcasing the underlining, hidden elements of this fair city, embracing the well-known and not-so-known people of Portland, Oregon. I’m a fan of Outlook Portland, and watch whenever I get the chance. So when I learned that host Rick Emerson -who is also a well-known local radio personality- was inquiring about a new direction for the show, I offered the services of Oakley Design® to create a new intro and new segment-break graphics. After much discussion, a few rounds of sketches, and a trial/test period (and with the help of Channel 32’s resident motion-graphics god, Collin Ivy), the new opening graphics and segment-break cards premiered on Sunday, Feb 14, 2010. And to my surprise, my friend Bill Oakley, best known for his work with The Simpsons and Futurama, was their very-special guest. It was bookend Oakley's at Outlook Portland. As for the graphics themselves, allow me to quote Mr. White from That Thing You Do! : "I want something peppy, something snappy." Although not quite "peppy" or "snappy", the new graphics have a classier appeal; a late night mood and charm. Creative Director Tim Oakley shot the photos himself, choosing iconic images that only a true Portlander would recognize, yet accurately convey the state's graphic history to every viewer, everywhere. Tim then outlined each photo, recreating every background and color palette to match its theme.Outlook Portland can be see every Sunday morning at 6:30am on Portland's Channel 32; episodes a posted to YouTube the following week.